War is evil; permanent war is permanent evil. 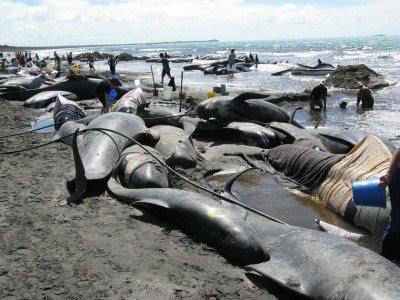 It is evil to humans but also to other species and the planet; the weapons used destroy us but also contaminate and destroy nature. Despite a general knowledge of the evils of war and acceptance of peace and the rule of law, war has become a permanent feature of the 21st century -destructive, cruel, dehumanizing and vindictive. Its message: those who can kill and destroy the most have the upper hand. Major General Smedley Butler said it in a speech in 1933: “war is a racket.” Butler, who had joined the Marine Corps in 1898, predicted WWII and ongoing wars thereafter; he served his country for 34 years but understood how war worked and our limits in putting an end to it (1). At the helm of 21st century paranoia with war we find NATO and the U.S. The U.S. has an aggressive history that includes its own Civil War, about a century after its war of independence in 1776, costing at a minimum the lives of some 620 000 to 820 000 soldiers. “He (G.W. Bush) reiterated his commitment to preemption in his West Point speech in June. The Bush administration obtained Congress’ approval for this attack knowing well that the UN would not authorize a resolution favoring a UN attack. Kofi Annan, then UN Secretary General, called the United States’ attack “an illegal act of war” but this did not end it. The American Congress authorization for the attack would turn into the facto approval for permanent war; the costs of war unexamined or optimistically under-estimated. The public everywhere remains ignorant of the actual costs of war that include not only our dead and wounded, but our enemies,’ civilians dead or wounded, the death of other species, and the economic and environmental destruction caused by war. Furthermore, the constant danger of war escalating into a global conflict is disregarded or dismissed. The hope in making all this more visible is increasing awareness about risks, so that rational, moral perspectives prevail and life holocaust is prevented. “It is possibly the oldest, easily the most profitable, surely the most vicious (racket). It is the only one international in scope. It is the only one in which the profits are reckoned in dollars and the losses in lives. A racket is…something that is not what it seems to the majority of the people. Only a small “inside” group knows what it is about…conducted for the benefit of the very few, at the expense of the very many. Out of war a few people make huge fortunes. In the World War [I] a mere handful garnered the profits of the conflict. 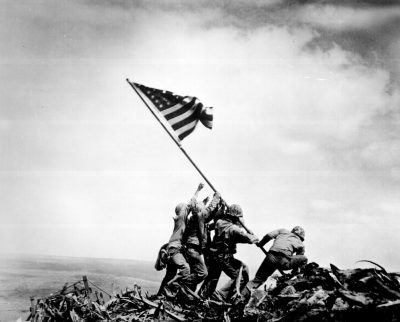 At least 21,000 new millionaires and billionaires were made in the United States during the World War. How many of these war millionaires shouldered a rifle? How many of them dug a trench? How many of them knew what it meant to go hungry in a rat-infested dug-out? How many of them spent sleepless, frightened nights, ducking shells and shrapnel and machine gun bullets?….. Many try to ignore how militarism contaminates the environment turning the issue into the “white elephant” sitting in the living room. The ecological print of the Military in the U.S. is undeniable and huge; and it is an issue even within the 4127 military installations sitting on 19 million acres of land. Maureen Sullivan, head of the Department of Ecological Programs of the Pentagon, recognized this in 2014 explaining that she was dealing with 39 000 contaminated sites with an estimated cost of 27 000 million American dollars. John D. Dingell, Congressman from Michigan, who served during WWII, argued that practically all U.S. military sites are seriously contaminated. Still, Hitler’s war machine would not have been possible without secret funneling of British and American funds through the Bank for International Settlements (BIS). The BIS original purpose was to facilitate reparation payments imposed on Germany by the Treaty of Versailles after WWII, the bank went beyond this. Established in Basil, Switzerland, in 1930 through intergovernmental agreements by a dozen countries, the BIS is today the central bank of central banks and essentially, a sovereign state paying no taxes, with sovereign grounds and offices, annual secret meetings and personnel holding diplomatic immunity. The Governor of the Bank of Canada (BOC), Gerald Bouey, bowed to the BIS dictates in 1974, since then the BOC lost its independence (16). She argues still that costs of war have exceeded even their cautious estimates. 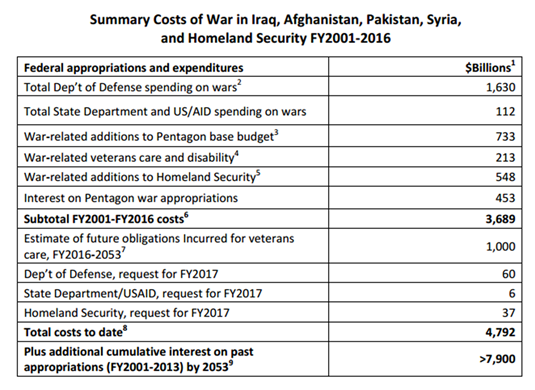 Crawford estimate make the post-9/11 wars very expensive, at more than $4.79 trillion current U.S dollars (see table below). In addition, she includes cumulative interests on past appropriations by 2053 of 7.9 Trillion U.S. dollars to a total cost of 12.69 Trillion U.S. dollars. In summary, the actual costs of war are difficult to put in numbers and even the numbers calculated by experts are so huge that are still difficult for most of us to grasp, we are talking about trillions of dollars in the case of the U.S. where actual costs have been well documented and where a large portion of war expenditures is taking place. There is much that has not been documented including the expenses paid by U.S. allies but also expenditures that are challenging to document, such as the costs of economic and infrastructure destruction, the costs of loss of life, incapacitation and human suffering of others involved and victimized, the costs of human rights violations and the costs of ecological destruction. Furthermore, with perpetual war there is a risk of precipitating our planet into an international conflict involving use of nuclear power that would cause ultimate destruction of our species and home. A focus on war seems pessimistic; most importantly it leaves out the only sane alternative: peace. We need to refocus on peace, to see peace for what it is: our only option. We already know that peace is good for the economy, for people, for other species and for our planet; we know war continues to cause ruin, pain and destruction to the financial benefit of few. Butler saw the challenge in 1933 and more than 80 years later we are still unable to make war a thing of the past. We are allowing war to escalate risking world proportion holocaust. We are the only ones who can stop the craziness. 8. “The Green Zone: The Environmental Costs of Militarism.” (Barry Sanders, AK Press, (2009). 12. “Canadian Military Spending 2010-2011.” (Bill Robinson, Foreign Policies Series, Canadian Center for Policy Alternatives). 13. “Canada Increase Military Spending NATO” (The Guardian, June 7, 2017). theguardian.com/world/2017/jun/07/canada-increase-military-spending-nato. 16. “Beyond Banksters. Resisting the New Feudalism.” (Joyce Nelson, Watershed Sentinel Books (2016).